HomeBlog July 2015 The Key to 20 Years of One Stroke Success! The Key to 20 Years of One Stroke Success! Have you ever wanted to learn a painting style called One Stroke? Ever wanted to meet Donna Dewberry and some of her leading One Stroke instructors? You already know how to One Stroke paint, but want to get a refresher or brush-up on your technique or learn something new? How about a trip to Orlando, Florida, to join up with other enthusiastic One Stroke painters to be inspired? If you can answer YES to any of the above, you MUST check into attending Donna's "The Keys to 20 Years of One Stroke Success" painting convention!! YES, it has been 20 years of success for Donna and her husband, Marc! 20 Years of sharing her love of painting and teaching others her painting techniques where the trick is to load your brush with different values and then paint a stroke creating shadows and highlights all in one brushstroke! It is amazing to watch her! Donna's convention is scheduled July 21 - 24 this month!!! It will be held at the DoubleTree at Universal hotel at 5780 Major Boulevard, Orlando, Florida! A perfect spot for the entire family, while mom enjoys the latest and greatest in One Stroke classes and activities, dad and the kids can tour the local theme parks or simply enjoy fun in the sun at the pool! During the Convention, Donna will share daily with all attendees the latest fun products and techniques including her ReDew program teaching eager students how they can venture out, recycling thrift store finds into beautiful family keepsake furniture as shown above! Included in the price of the convention will be classes taught by Donna and some of her special guest teachers, evening painting sessions, a fashion show, a competition of painted pieces, an awards ceremony and so much more. Please visit Donna's website to learn more and sign up to attend. 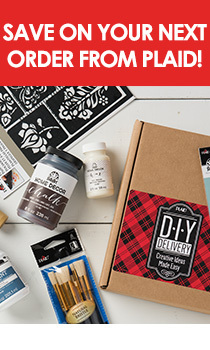 And of course, a Plaid team will be in attendance ready to share an extra special day filled with new product presentations, a super fun class and product samples. But no Plaid event would be complete without some door prizes and goodies bags for attendees! I invite you to come join in Donna's fun! In this post, I also want to share with you a few One Stroke treasures that live on plaidonline.com. Don't you just love this piece that Donna painted showcasing a lovely, large and loose cabbage rose / blossom? Personally, I LOVE the shabby chic feel. Want to recreate it? You can find the instructions here. And this One Stroke blossom and bird Donna painted over a FolkArt Home Decor Chalk - Vintage Mustard painted and distressed Kerr caning jar ... so trend right! It can be recreated in an afternoon start to finish! And let's take a tip from Donna ... we can all use some organization in our lives, right? Painting this wooden magazine / book holder with fun stripes and One Stroke tulips will encourage all of us to clean up and stay organized! You will find the instructions to recreate this piece here. But don't forget to add the wood circle feet, a really nice touch! Visit Donna's website today to sign up for The Key to 20 Years of One Stroke Success. A FABULOUS time will be shared by all who attend, I promise! I am looking forward to my time in Orlando at the One Stroke Convention too! Come join me, won't you? Together, we will learn, laugh and love One Stroke!